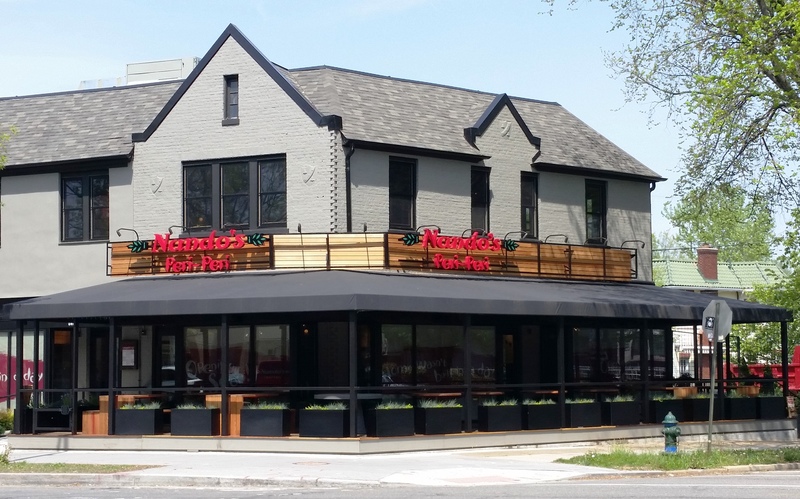 Nando’s is Finally Here – And It’s Worth the Wait | Tenleytown, D.C.
Posted on May 21, 2014 by Tenleytown, D.C.
Before I begin, a disclaimer – my relationship with Nando’s goes back to the late 90s when some South African friends looking for a taste of home took me to one of the chain’s restaurants in London. I was hooked. And when Nando’s PERi-PERi came to DC, I was among the first in line. Now that the Afro-Portuguese chicken restaurant has come to Tenleytown, I’m downright excited. OK, so maybe the relationship is not a formal one. I am just a loyal customer. And here’s why you too should give Nando’s in the neighborhood a try. 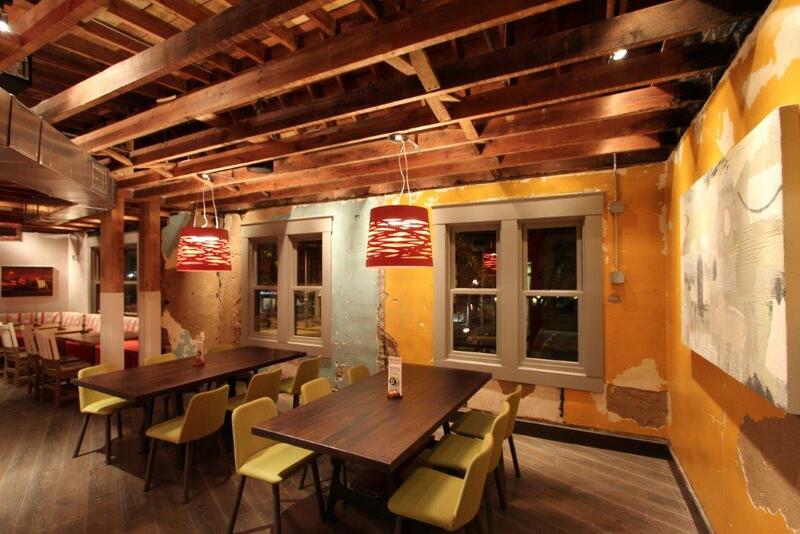 Nando’s took over the space formerly occupied by Armand’s Chicago Pizzeria, which closed in 2012. After an eight month renovation, the restaurant has transformed the dilapidated pizza parlor into a vibrant, modern space with a nod and respect for the 87-year-old building’s history. The 4,500 square foot space retains the exposed brick, original doors and transom windows, and second floor sky lights of the drug store that first opened in 1927. As with all Nando’s restaurants, South African artwork decorates the walls. There is ample seating on two floors, as well as a delightful wrap-around deck that seats 48 – with ceiling fans and heating units, the deck should offer three-season outdoor seating. But what about the food, you ask? Many in Tenleytown may have dined at other Nando’s, but for those who haven’t the fast-casual restaurant specializes in flame-grilled chicken basted in its signature PERi-PERi sauce, as well as fresh salads and hearty vegetable sides. My family and I joined Nando’s in Tenleytown on Monday for the soft opening, enjoying the new baby kale and chicken salad with crispy chick peas – love those chick peas! – mixed greens, olives, cherry tomatoes, creamy yogurt dressing and a spicy kick; a traditional quarter chicken with PERi-PERi sauce; and a kid’s meal of grilled chicken strips and Portuguese rice. We also shared sides of the butternut squash with grilled corn, dried cranberries, and red onions, and, my personal favorite, the macho peas, a tasty mix of peas, parsley, mint, and chili. Don’t judge – we were hungry. As a loyal customer, I certainly was not disappointed. The meal was healthy, hearty, and most importantly, delicious. Neither my husband nor son had eaten at Nando’s before and both gave it a solid thumbs up. As parents, my husband and I are glad Nando’s offers healthy meals for kids rather than the usual fried and breaded options of other family restaurants. My son loves that the meal comes with endless frozen yogurt. It’s a win-win. During our meal, the wait staff and hosts were attentive and quite friendly though perhaps slightly slow in getting the food out, but that’s if I’m being picky – it was day one of a soft opening after all. And if I’m being really picky, the music on the patio was fun, but slightly too loud. Don’t let those minor criticisms deter you from trying Nando’s today. 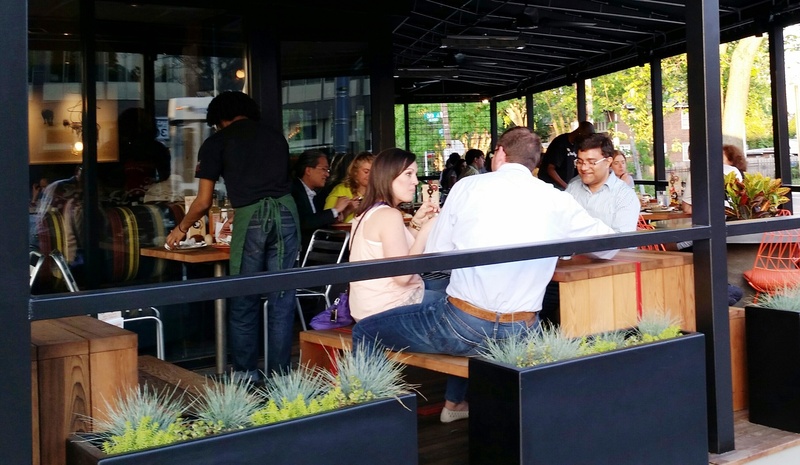 The restaurant has been a long time coming to Tenleytown, but it’s been worth the wait. So welcome our new neighbor and stop by Nando’s for a meal – let’s support this great addition to the community. Nando’s PERi-PERi is located at 4231 Wisconsin Avenue, NW, and is open 11:00 a.m. to 10:00 p.m. Sunday through Thursday and 11:00 a.m. to 11:00 p.m. Fridays. Have you eaten at Nando’s in Tenleytown? Share your thoughts on the new restaurant in the comments section.